TIRED OF DRINKING YOUR HOT DRINKS TEPID AND COLD DRINKS WARM? AREN'T YOU FRUSTRATED WITH JUST HOW POORLY TUMBLERS LOSE THEIR PERFECT TEMP? SMART COOLER 20 oz. is a stainless steel insulated tumbler that keeps your cold drinks ice cold and hot drinks piping hot for a long time. With Smart Cooler you will get your hot coffee hot and cold drink cold every time. - GREAT DESIGN: Great technology has gone into designing your Smart Cooler and is has made of premium grade stainless steel. Our design and cutting-edge, reinforced lid insulation ensure effortless use and maximum drink temperature retention capacity. It is ergonomic design makes it easy to handle and contributes to its sleek good looks. - RETRACTABLE COVER, LESS REFILLS! : Love to sip from a straw? No problem! Our lid's wide mouth and slip cover accommodates either sipping directly or using a straw, hassle-free! Owing to its exceptional clarity, you can effortlessly peak at your tumbler's contents and ONLY fill up when it's time for MORE! - ADVANCED INSULATION, TIGHT SEAL: We manufacture our tumblers aiming for your ultimate satisfaction and convenience. Sealing firmly on your tumbler's mouth, our lid prevents accidental spills and leaks, ensuring you enjoy every last drop of your favorite drinks! - 100% SAFE, LIDS MADE FROM HEAVY DUTY TRITAN: Taking advantage of Tritan's inherent properties, we have come up with the best lid currently on the market! BPA-Free and RID of ANY other chemicals, it is absolutely safe to use. 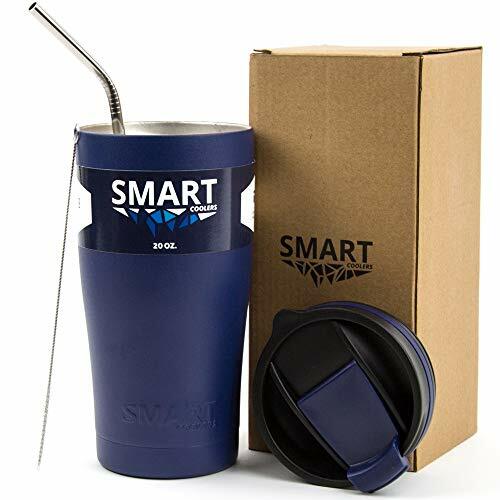 SMART COOLERS IS THE PERFECT MUG FOR HIKERS, CAMPERS, ATHLETES, STUDENTS, GAMERS, PROFESSIONALS, BEACH LOVERS, ROADTRIPPERS, DRIVERS, RAMBLERS, PARTY FANS, SAILORS, MOVIE LOVERS, BBQ EXPERTS, DRIVERS, AND TRAVELERS. ☞ Just click "Add To Cart" and start enjoying it! We are sure this is a smart decision! NEW SMART COOLER 20 OZ 100% LEAK-PROOF. LAUNCH PRICE: Get your Smart Cooler 20 oz ST Teal for ONLY $19.99 for a few days. ORDER YOUR SMART COOLER WITH PEACE. If you are not 100% satisfied with your tumbler, just return it within the first 30 days and get a FULL REFUND. LIFETIME WARRANTY. If your cup fails we will change it for another cup or refund your money. LEAK-PROOF SCREW LID: Smart Cooler's lid screws in tight so you get a perfect seal every time. It leaves enough space to use your favorite stainless steel straw (not included). The lid's material will keep your favorite drink at the desired temperature. If you have any questions about this product by Smart Coolers, contact us by completing and submitting the form below. If you are looking for a specif part number, please include it with your message.